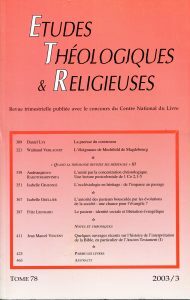 Cet article reprend les principaux résultats de sa thèse La théologie de Mechthild de Magdebourg : le concept d' »éloignance », soutenue à Montpellier sous la direction d’Hubert Bost. Mechthild of Magdeburg, first mystic to write in German in the middle of the 13th century, has fashioned in her work « The flowing light of Divinity » a specific concept called « gotz vroemedunge » translated here by the word « eloignance », a neologism derived from the example of « suivance ». This concept is presented by Mechthild in the narrative mode and is here approached alternatively from a historical, a semantic and a psycho-anthropological perspective in order to highlight its relevance when criss-crossing these strategies.